Lyn Mann started quilting in 1981 and has been “hooked” ever since. Six years later, Lyn started teaching and found that this was where her real gift was. Over the past years, she has taught thousands of students and loves the one on one approach to teaching. Ever active in her quilt community, Lyn was a past president of Flying Geese Quilt Guild and belongs to 3 Orange County quilt guilds. She is also a member of both Northern and Southern California Quilt Councils. Besides teaching for guilds through-out the United States, Lyn has taught at “Road to California”, “Quilt Utah”, “Camp Watch-A-Patcher” and “Quilt Camp In The Pines” quilt conferences. Lyn has taught on 7 quilting cruises including Alaska, the Hawaiian Islands and a cruise from the West Coast of Africa to Barbados. In 1998, she was the featured artist for the Christmas exhibit at the La Conner Quilt Museum in La Conner, Washington. Lyn has made over 440 quilts and designed approximately 70 for mysteries alone. 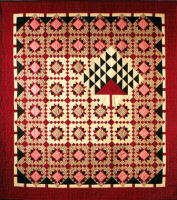 She has had quilts pictured in 5 different major quilt books and 6 different quilting magazines. The featured book for the 2004 So. California quilters run was ”Hit The Pavement” a book that Lyn wrote. She also wrote a series of 8 articles for Quilters’ Newsletter called “Slick Tricks”. Currently, Lyn is working on a series of “skewed” quilts that use a special template to produce a very wavy looking block that is still mathematically designed so that all the seams fit together. Lyn sells her book and patterns thru her company called Penache. It was also the publisher of “Hit The Pavement”.